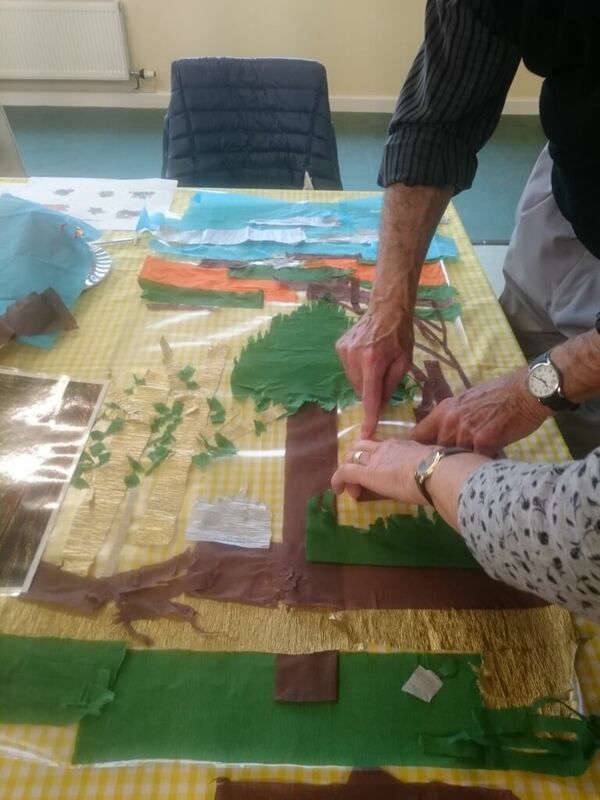 Blackdown Hills AONB’s Nature and Wellbeing project, Alzheimer’s Society and Ferne Animal Sanctuary have been working together to help members of Chard Memory Café to connect with others by accessing local landscapes through seasonal art sessions. Nature and Wellbeing volunteer, Sue, has been leading seasonal art workshops with members of Chard Memory Café. Chard Memory Café, run by Alzheimer’s Society, is a meeting place for people living with dementia and their carers. Living with memory loss can be challenging, severing social connections at a time when they are needed most. The idea behind the art sessions is to inspire conversations and reminiscing, using photographs, maps and other information to trigger memories and ideas. Many of Chard Memory Café’s members grew up in the Blackdown Hills and enjoy sharing stories of cycling and picking apples from local orchards during their childhood. Members have created some beautiful seasonal artwork, which has been exhibited in Ferne Animal Sanctuary’s new visitors centre. Staff members at Ferne Animal Sanctuary have become ‘dementia friends’ – Alzheimer’s Society’s initiative to encourage people to increase their knowledge and understanding of dementia. The team at Ferne now supports regular visits from the Memory Café members and offers volunteering opportunities.